Sounds unpleasant doesn’t it. Do you trust me? I love juices. When I’m craving something sweet, when I’ve eaten too much cake the days prior, when I just need some fruits and veggies and I need them fast, or straight up when I feel like a healthier option. But what pains me, every time, is the amount of food waste juicing produces. And what’s worse is that it actually is neither inedible, nor bad for you. So why do we insist on throwing it out, without so much as the blink of an eye? Bestovers are the way forward. They have to be. Thus, here it is. My Compost Cake. Yes it just so happens to be filled with nutritious ingredients and wonderfully healthy which means you can shamelessly eat it at any and all times of the day. But it is also, absolutely delicious (if I do say so myself). I don't actually have a juicer. But I get creative with my various kitchen tools... And when I really can't be bothered? I pop on down to the local juice-selling grocery store and ask for their leftover juice pulp. It was headed for the bin anyway so they're more than happy to oblige. Just saving the planet one plate of leftovers at a time, you know. Hypothesis: this cake can be made using multiple juice pulp flavours. Experiment: recipe tested using Orange and Apricot pulp, Carrot and Apple pulp, and Orange and Pear pulp, (yes they just so happened to be orange in colour…). Conclusion: you can in fact make this cake with whatever sweet juice pulp you just so happened to press. Please promise me you’ll at least try this cake the next time you make a juice? nibs etc. Original recipe. Makes 1 x 25cm (10in) loaf. Preheat your oven to 350F/180*C/170*C Fan. Oil and flour your cake tin – I used a 25x11cm (10x5in) loaf tin. 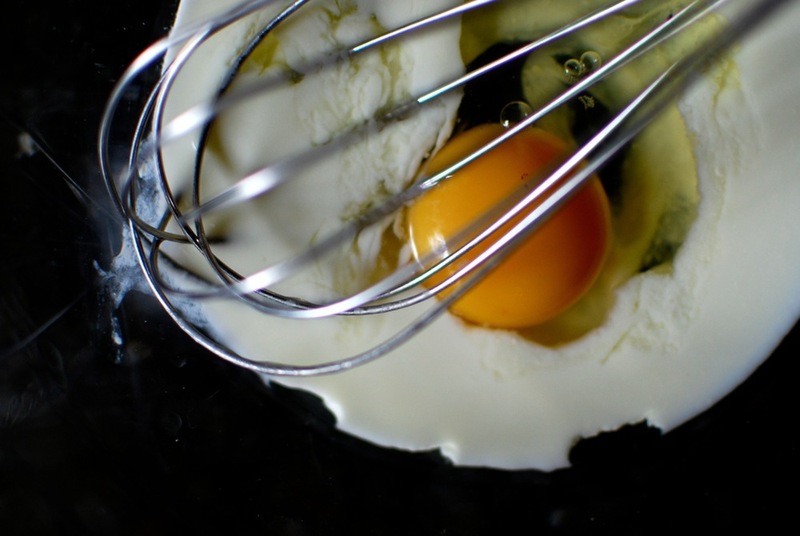 Into a mixing bowl, break and beat your egg. Add the maple syrup and olive oil, and mix until combined. Then add the Juice Pulp, and stir until just incorporated. Next, add your dry ingredients: almonds, coconut, flour, leavening agents salt and cinnamon. Mix until fully incorporated. Roughly chop your hazelnuts to desired size, and add to the batter. Then rough chop your raisins, toss with a pinch of flour (which will prevent them from sinking to the bottom of your cake as it bakes), and toss into your mixing bowl. Carefully fold until well distributed throughout the batter. Pour into your mold and bake in the centre of your oven for 35-40 minutes, until nicely golden brown, and toothpick comes out clean (if it starts to turn quite dark around the edges, cover with a sheet of foil, and continue to bake as normal. When ready, remove from the oven, place on a wire rack, and allow to cool almost completely. Once cooled, turn out, plate with the loaf crust on top, and serve. The cake will keep up to a week, covered and at room temperature, or sliced and frozen for a month or two (toast/microwave/pan sear to reheat). For breakfast, elevenses, lunch, afternoon snack, dinner, dessert, and any other meal time you can think of. Toast a slice or pan sear it with a touch of butter, turning it into your new favourite breakfast toast. Topped with: yoghurt (greek, skyr, quark, plain, flavoured) + drizzle of honey, yoghurt + granola, yoghurt + fresh berry compote/jam, yoghurt/ricotta + fresh/poached peaches, little salted butter and jam. The possibilities are literally endless. Substitute hazelnuts with walnuts, almonds, peanuts. Substitute raisins with cranberries, dried figs, dried apricots. Use a savoury juice pulp + an extra 1/4 cup brown sugar. Or, DON’T add the extra sugar and make it a savoury loaf! Toast (or not, as you prefer), top with: mashed avocado + soft boiled egg, salted butter + thinly sliced radishes, ricotta + prosciutto - note: I can't say I've actually tried this yet... however. My mouth just watered while writing this, so I can say with 100% certainty that I will be trying it as soon as I get my hands on some savoury juice pulp.